A heart warming flash mob chorus performance of popular Chinese songs at the food court of CWTC (GuoMao), Beijing, China. The songs performed are: "The Moon Represents My Heart" (yue-liang-dai-biao-wo-de-xin), "The Crescent Moon" (wan-wan-de-yue-liang), "Oh How Sweet" (tian-mi-mi), "Let's Row the Paddles" (rang-wo-men-dang-qi-shuang-jiang), "Jasmine" (mo-li-hua), "Standing at Hilltop" (zhan-zai-gao-gang-shang), "Mountain Is Green" (gao-shan-qing). 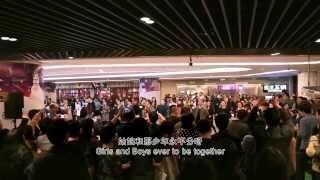 驚喜合唱 北京國貿 Flash Mob Chorus at CWTC Beiji @ @ jerrychumf 社會科學 提供社會科學的 ... 驚喜合唱 北京國貿 Flash Mob Chorus at CWTC Beijing. 驚喜合唱 北京國貿 Flash Mob Chorus at CWTC Beijing. ... 驚喜合唱 北京國貿 Flash Mob Chorus at CWTC Beijing. 驚喜合唱 北京國貿 Flash Mob Chorus at CWTC Beijing. 驚喜合唱 北京國貿 Flash Mob Chorus at CWTC Beijing. 1. Add a comment... In his circles. ... 驚喜合唱 北京國貿 Flash Mob Chorus at CWTC Beijing. 1. 驚喜合唱 北京國貿 Flash Mob Chorus at CWTC Beiji. 驚喜合唱 北京國貿 Flash Mob Chorus at CWTC Beijing. ... 台灣「驚喜合唱」移駕北京. 驚喜合唱 北京國貿 Flash Mob Chorus at CWTC Beijing. 驚喜合唱 北京國貿 Flash Mob Chorus at CWTC Beijing ... 台灣「驚喜合唱」移駕北京.